Codesign Technologies Recognized as a Leading Marketing & Advertising Agency in Canada! - Codesign Technologies Inc.
Codesign Technologies Recognized as a Leading Marketing & Advertising Agency in Canada! At Codesign Technologies, we offer a wide range of Web Design & Digital Marketing services for every budget. Our clients include start-ups, small businesses as well as global enterprises. We specialize in Responsive Website development, E-Commerce, Content management systems, and much more. We always aim to set a higher standard of output that leads our clients to have confidence in our services; we believe that building a strong connection with our clients is beneficial to achieving all of our customers’ marketing goals. While we have been profiled with Clutch before, it is our great honor to announce that we have been named as a Canada Leader in the field of Marketing & Advertising for 2019. We have seen tremendous growth since we first launched as a company in 2015, and this award is a true milestone as we continue our journey as a leading firm in our industry. In addition to being named a leader, we have also been included in Clutch’s list of companies providing top-notch SEO services in Canada. Check out what some of our previous clients have to say regarding our service! – President, Pierson’s Funeral Service Ltd.
Clutch’s resources also include their sister sites: The Manifest and Visual Objects. On The Manifest, we have just been named among the top digital marketing agencies in Calgary – a distinction that will help us reaffirm our brand strength in our local market. Furthermore, we have been named among other top digital marketing agencies on Visual Objects, and innovative portfolio platform that helps companies searching for our services quickly assess and evaluate our work history and overall performance as a firm. 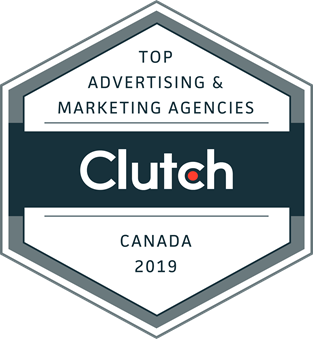 Overall, we are very honored to be included in Clutch’s list of Leading Marketing & Advertising Firms in Canada and we hope to expand as 2019 continues. We would like to thank our team for the time they have invested in our firm and we will continue to remain dedicated to providing excellent service for our clients in Canada and around the globe.